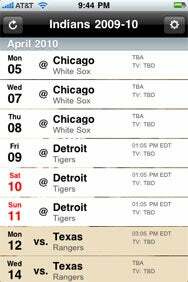 Do you find yourself wishing you could easily carry your favorite Major League Baseball team’s schedule around with you for easy reference? My Baseball Team Schedule 2010 from Vladimir Svidersky allows you to do just that, right in time for first pitch of the 2010 season. Unfortunately, this $1 app is far from a perfect pitch. Incomplete Schedule: My Baseball Team Schedule 2010 lists all the games in the upcoming baseball season. But game time and TV information is missing in some cases. And there’s no way to jump to a different month, other than scrolling. After you designate a favorite team in the settings, My Baseball Team Schedule 2010 presents your team’s schedule in list format—a very long list, to be exact. You flick through the schedule but quickly discover that there’s no way to jump ahead to a particular month. If you’re looking to see your team’s schedule for July or August, be prepared to scroll for a while. The only way to sort games in this app is by opponent. Doing so requires changing a setting on a different screen, and the result displays only games against a particular opponent. Fans hoping to catch a Yankees-Red Sox showdown or a Cubs-Cardinals tilt may find that useful. The app color codes Friday and Saturday games in red to make them stand out. But again, there is no way to filter the schedule beyond this. About half the games listed feature start times; the other half display a start time of "TBA." Each entry also has a spot to list TV broadcast information, though I could only find “TV: TBD” when I tested the app. My Baseball Team Schedule 2010 is a simple, unpolished app. The small fee may be worth it to some users looking to have a schedule at the ready. But the app is far from complete and, frankly, seems unfinished at this time.